Arduino Leonardo is a pretty new microcontroller board based on the ATmega32u4. It has 20 digital input/output pins (of which 7 can be used as PWM outputs and 12 as analog inputs), a 16 MHz crystal oscillator, a micro USB connection, a power jack, an ICSP header, and a reset button. It contains everything needed to support the microcontroller; simply connect it to a computer with a USB cable or power it with external power supply. Arduino Leonardo code libraries allows the board to emulate a computer keyboard, mouse, and more. 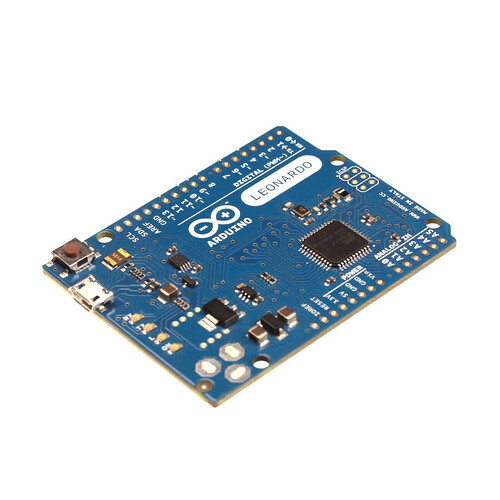 Arduino Leonardo comes in two different flavours: with headers and without headers. The Leonardo differs from all preceding Arduino boards in that the ATmega32u4 has built-in USB communication, eliminating the need for a secondary processor. This allows the Leonardo to appear to a connected computer as a mouse and keyboard, in addition to a virtual (CDC) serial / COM port. And since the communication with the computer is done through a simulated serial port over USB, the hardware serial port on the processor is free for your applications. There is also another new member in Arduino family. Adafruit’s got a new board, an official Arduino article tells that there’s a new Arduino in town, this time designed in conjunction with Adafruit. It’s the Arduino Micro, a very neat little board designed for breadboard use. The new Micro takes all the best features of the new Arduino Leonardo and shrinks them down to a convenient stick of gum-sized package. It’s powered by the ATmega32u4 microcontroller. Like the Teensy boards (and Arduino Leonardo), the Micro is able to function as a USB keyboard or mouse. I have not had yet any hands-on experience with those boards, but maybe some day I have. The closest thing I have tried to those is MaKey MaKey board that uses Arduino Leonardo firmware. The world probably has enough ATMega32u4 (Arduino Leonardo) development boards. Some of them even put all the pins on a .100″ grid (unlike the original Arduino outline). But we feel that none of them is as easy to use on a breadboard as the BBLeo, which stands for breadboard Leonardo. The BBLeo is engineered to get you going quickly on a breadboard. Just as in the Arduino Leonardo, the BBLeo has USB built in so you can just “plug and play”. Hint – all this great functionality that board developers like to brag about is usually built into the chips. Manually typing your login password every time you need to login on your computer can get annoying, especially if it is long and complex. To tackle this problem [Lewis] assembled an NFC computer unlocker by using an Arduino Leonardo together with an NFC shield. [Ido Gendel] was thinking about new and interesting ways to send data between devices, when he realized that the answer was right in his hand. Literally: he decided to try sending data using the mouse pointer. What he came up with was an interesting hack that uses small movements of the mouse pointer to send data at up to 1200bps, or about 150 bytes per second. The way he did this was very, very clever. He used an Arduino Leonardo that is set to emulate a mouse, working alongside his existing mouse. This setup means that he can use his existing mouse: the system just sees the Arduino as a second mouse, and the pointer just looks a little jerky when you zoom in. That is because the Arduino is just sending tiny movements, each of which is a code that represents a nybble (4 binary bits) of data.